I spent a good few years as a devotee to pricier haircare products. Moroccanoil and Macadamia in particular were my favourites for shampoo, conditioner, deep treatments and hair oil – but their place in my bathroom cabinet has been well and truly ousted recently by a total high street bargain from the new Garnier Ultimate Blends range. Garnier’s brand new offering consists of six different ‘ultimate blends’ with luxurious textures that defy their price, and containing a whole host of lightweight precious oils and restorative plant extracts from all over the world. The blend I’ve been using is The Marvellous Transformer for dry, lifeless hair. As you probably know, my roots are super oily but I prefer to concentrate on the lengths and ends which are indeed dry and lifeless. The Marvellous Transformer products contain a healthy dose of haircare favourite Argan oil along with Camelia oil which has been favoured by the Japanese for centuries. And let’s be honest here – have you ever seen a Japanese woman with hair that isn’t sleek and gorgeous?! The Marvellous Transformer Shampoo* (£2.79/200ml) is transparent in colour and quite runny in texture – so be careful when you squeeze the bottle as I’ve accidentally squeezed out twice as much as I need on a few occasions! The Marvellous Transformer Conditioner* (£2.79/200ml) is pretty standard stuff and not much to write home about, but The 1 Minute Treatment* (£4.49/200ml) is definitely a winner. Ain’t nobody got time to hang around for 10 minutes letting a deep conditioner penetrate the hair so this one minute wonder is ideal. Sumptuous and thick in texture, yet it doesn’t leave hair feeling heavy or weighed down. Lastly we have the Marvellous Glow Oil* (£9.99/150ml) which is super affordable for a hair oil and, in my opinion, is as good at its job as Moroccanoil. The scent is divine, too. This is such a good range for its price point. The products genuinely feel high end and perform to the standard I’d expect from a much more expensive brand. I’m never left feeling greasy after washing and drying like I can be with other brands and products, so all in all I’m a very happy bunny. Something else I really like is that the shampoo and conditioner are available in 200ml or 400ml sizes, which is great – I go through shampoo at twice the rate of conditioner so to be able to get a 400ml shampoo and 200ml conditioner (or the 1 Minute Treatment, which I do prefer) is a small pleasure that seems to simple but appears to be a lot to ask from most brands! 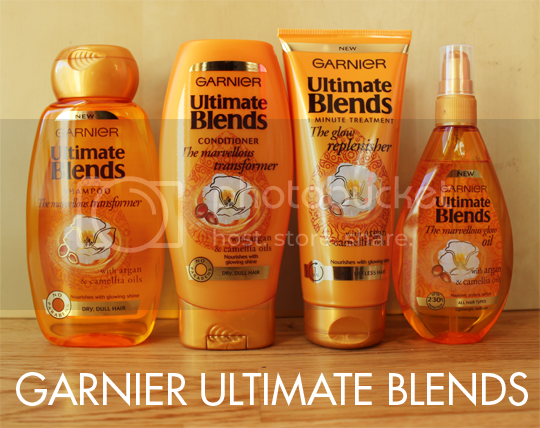 The Garnier Ultimate Blends ranges are rolling out across stores this month, it should already be available in many places including Boots. I’m really liking this range at the moment!